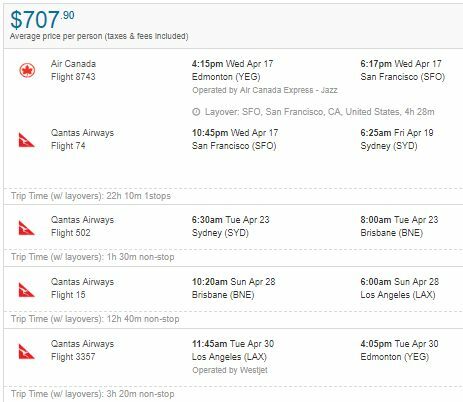 Qantas has once again dropped the price of their flights from Edmonton to cities in Australia, this time down to between $651 and $672 CAD roundtrip including taxes! 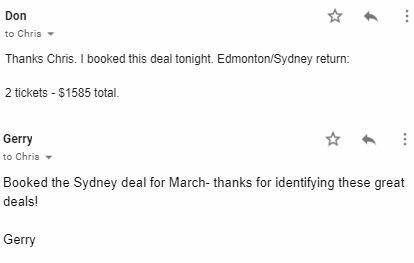 This is a new record for the cheapest roundtrip flights from Edmonton to Australia. 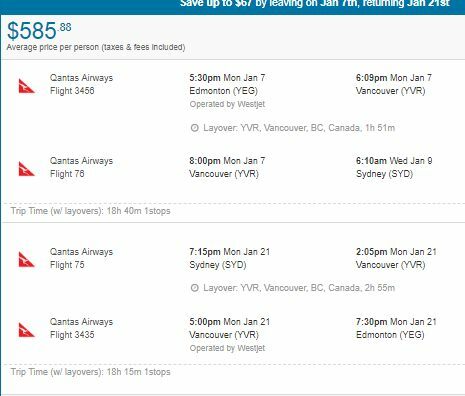 Update @ 9:15 PM MST - Qantas is now showing a few flights from Edmonton to Sydney in January for $585 CAD roundtrip including taxes!! (see update below). You can also find flights from Edmonton to a few other places in Australia and New Zealand (Adelaide, Canberra, Hobart, Christchurch) for a lot less than their usual price... ($768 to $876 roundtrip). Instructions below. - look for the dates that are somewhere between $696 and $713 roundtrip. 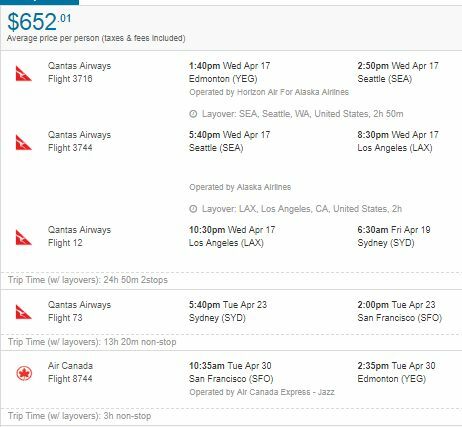 Update @ 9:30 PM MST - Qantas is now showing a few flights from Edmonton to Sydney in January for $585 CAD roundtrip including taxes!! For example, let's say you found a flight from Edmonton (YEG) to Sydney (SYD), from Apr 17 to Apr 30. For example, here is a screenshot from Flighthub of Apr 17 to Apr 23 to Apr 30. For example, here is a screenshot from Flighthub of Apr 17 to Apr 30. 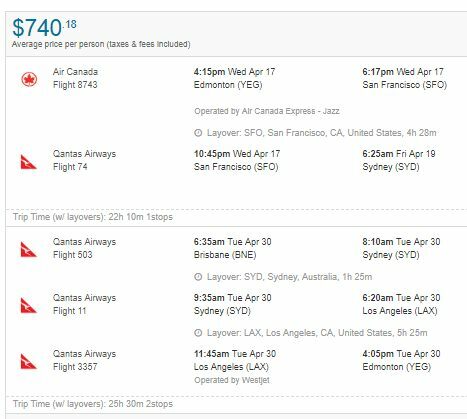 It's even possible to visit multiple cities in Australia *and* Los Angeles and still keep the price at $707! 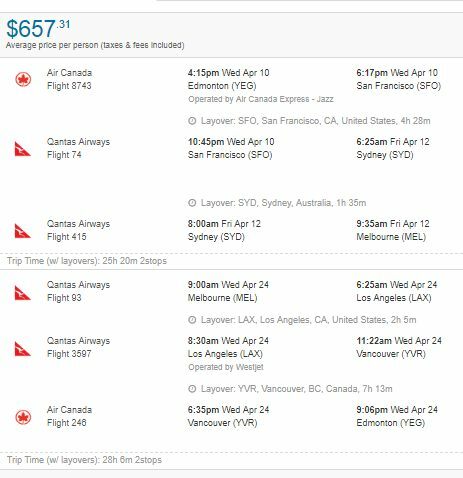 6 Responses to "Edmonton to Sydney, Brisbane, or Melbourne, Australia - $585 to $672 CAD roundtrip | new record!" It works on multi-city too! Just booked into Brisbane and out of Sydney. Thanks, Chris! Booked YEG to BNE in April, $711!! Hubs is going to FREAK! Thanks for the intel! A few days late.... but I did book a trip during the sale. 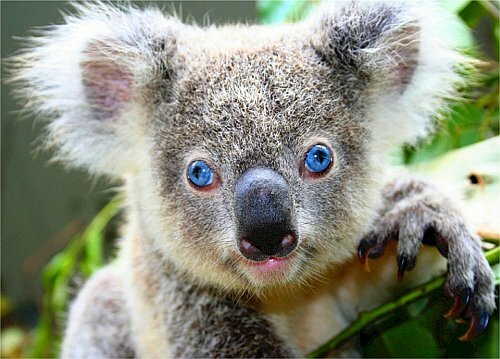 Leaving late February, $667 RT to Brisbane, with a day "layover" in Sydney on the way there. Thanks Chris!! No problem Phalyn, Roni, and Matt. Have a great time in Australia! Missed out on the sale... Do you see prices droping this low again or do you think it was a one time thing?